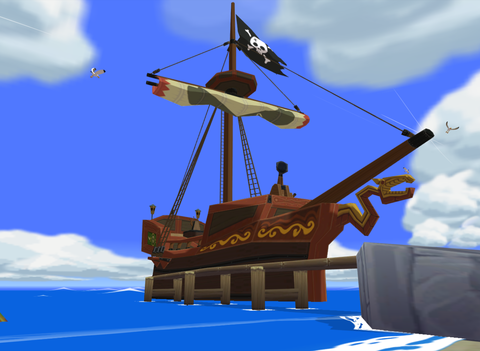 You will arrive on the Pirate Ship after leaving Outset Island. Tetra makes fun of you because she thinks bringing you along with her is a nuisance. She tells you to go find Niko, one of the crew members. While on the deck of the ship, you can walk around and talk to whoever you please; however, to progress in the game, you must go below deck by heading through the door on the opposite side of the ship's helm. Once you go through the door, head down the stairs until you find Niko. Walk down the stairs and you'll meet Niko. He will show you a minigame in which you must raise platforms and then swing from ropes to get to the end. Niko teaches Link how to swing on ropes. When he is finished explaining, hop to the first platform. Hop at the rope, and swing to the next platform, and the next, taking your time, and so on until you reach the end. If you fall off, Niko will explain how to turn when you're holding a rope, by holding . The advice is to line up to the rope and at least swing twice before you hit the platform. You will overstep the platform if you swing once and jump the platform. The last part if the platform did lower itself, line yourself where Niko is and take a few swings onto the final spot to finish this puzzle. To easily get across the room, you will want to line yourself up with each platform you want to swing to. Press to center the camera behind you, making sure there is a rope directly in front of you. 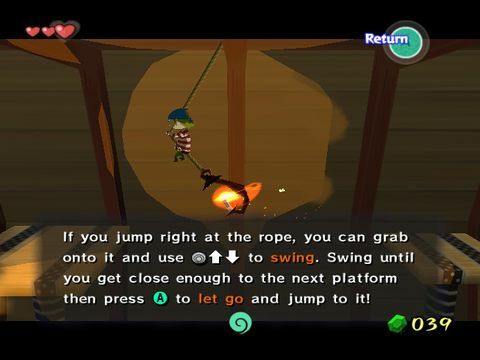 Rather than swinging back and forth on the ropes, you should leap off by press right at the end of the first swing. When you astonish Niko by getting to the end, he will give you the contents of the treasure chest behind him: the Spoils Bag. This will allow you to keep various items that you get off of monsters. It becomes useful later in the game. After you get the Spoils Bag, Tetra will call you up to the top of the ship, so go up the stairs you came in on and out the door. Once outside, climb up the ladder in the middle of the ship to the top, and you will begin a cutscene where you are launched into the Forsaken Fortress. This page was last edited on 17 April 2014, at 16:02. This page has been accessed 12,369 times.